Buying the right mattress is an important decision for many people. We all have our own personal preferences that determine what we want or what we need our mattress to provide to achieve a good night’s sleep. 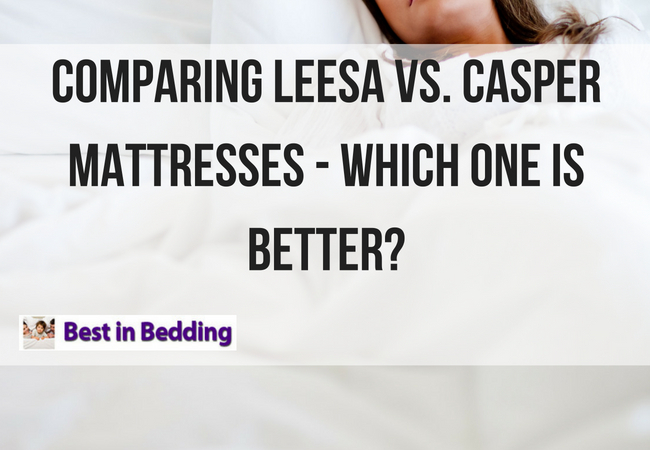 Here we compare Leesa vs Casper mattresses. The sheer number of mattresses that are offered in-store and online provide a world of opportunity for buyers to find the perfect mattress to suit their needs. However, the abundant selection can also be daunting. Additionally, trying to pick through the many brands, and types of mattresses that are available can be confusing – and overwhelming, to say the least. Those of us at Best in Bedding want to give you a helping hand in finding a mattress that is right for you. Today we are sharing a thorough inside scoop of two leading companies online that sell high-quality mattresses: Casper vs Leesa. What sizes are available for each brand? What Are Their Customer Ratings Like? Leesa vs Casper: Which Mattress Should I Buy? This comprehensive review gives readers an overview of the popular Casper and Leesa mattresses. We focus on the factors that individuals care about most when looking to purchase their next bed. Both products have been praised for their high quality, and although they share several similarities, there are also some key ways in which they differ. Those of us at Best in Bedding have researched and analyzed customer reviews, compared product features, and compiled the standard specifications of each mattress to provide readers with reliable insight into which mattress may bring them the most comfort each time they sink into bed. Continue reading the Leesa vs Casper mattress review below to determine which mattress may best suit your sleeping needs! Weight: 42 – 92 lbs. Weight: 55 – 104 lbs. Leesa and Casper are both categorized as foam mattresses because their materials are comprised of at least 79% regular foam. Both models are made up of several layers of different types of foam for comfort and support purposes. While the construction of both mattresses features their respective layers of support foam and memory foam, their comfort layer makeup and layer thickness are where they each differ. Both mattresses stand out amongst their main competitors by including a layer of memory foam within their construction designs. This foam layer is specially designed for body-contouring purposes, as well as pressure relief for sleepers. Both models feature above-average motion isolation, which means that individuals who share a mattress with a partner will be less likely to disturb their partner as they move around on the mattress or get up out of bed. For that purpose, then, the amount of motion transfer can be an important consideration for couples that include at least one light sleeper. 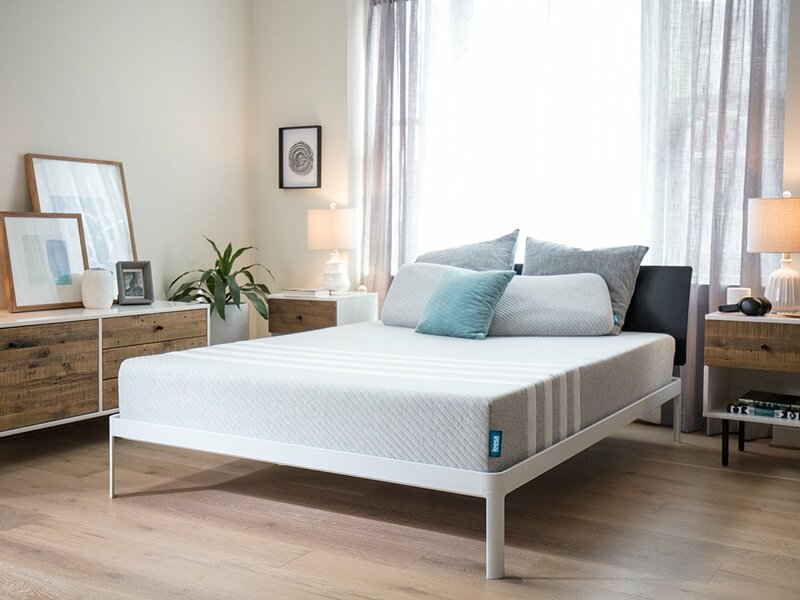 The Leesa mattress features very subtle motion transfer, and the Casper mattress, too, has consistently received positive reviews for its low motion isolation. People who sleep on their side, back or stomach tend to have different needs when it comes to finding a mattress that offers the level of comfort and support they need. The Casper mattress has the advantage of being well-suited for all types of sleepers, including those who sleep on their side, back, or stomach. The slight hug of the foam material, however, may be deemed particularly comfortable for back and side sleepers. Excessive firmness has been reported by a small percentage of side-sleepers who weigh less than 130 pounds. The Leesa mattress offers more bounce to sleepers than the ‘hug’ that is characteristic of the Casper. Stomach and side-sleepers who weigh 130 and 230 pounds generally report the highest levels of comfort and support. The mattress has been reviewed as slightly to moderately less comfortable for lighter sleepers that rest on their side as it may be perceived as too firm. Regarding sleep position suitability, both products received the most positive reviews from back-sleepers. In addition to sleep position suitability and motion transfer, another factor that receives high consideration when mattress shopping is the firmness of the product. Many shoppers are wary of any foam mattress that would advertise itself as “firm." However, both the Leesa and Casper mattresses are above-average in firmness when compared to other products. The Leesa and Casper mattresses are advertised and reviewed as medium-firm to firm mattresses, although reviews have shown that this can vary somewhat based on the size or weight of the sleeper. With its thicker comfort layer, the Leesa mattress allows sleepers to sink slightly into their bed. The Casper, on the other hand, provides a ‘hugging’ sensation as it contours to your body. According to the site, Sleep Like the Dead, which collected data from reviewers, approximately 9% of users found the Leesa mattress to be “too firm.” This is compared to the 10% that provided the same answer for the Casper mattress. On a scale of 1 to 10, both mattresses lie somewhere between a 6 and a 6 ½ in firmness. Lifespan – They both boast roughly the same lifespan, able to maintain their quality for anywhere between 8 and 12 years. Weight – Although both mattresses weigh less than the average mattress, Leesa mattresses of all sizes are lighter than their Casper counterparts. Thickness – Leesa mattresses are just a half-inch thicker than Casper mattresses, measuring about 10 inches and 9.5 inches, respectively, in thickness or height. Mattress Cost – The prices for the mattresses are similar, but the Leesa mattress does cost slightly to moderately less than the Casper in all sizes. Both Casper and Leesa offer mattresses that are available in six sizes. They are - Twin, Twin XL, Full, Queen, King, and California King. The cost between the two mattresses is similar. However, Leesa mattresses are all in all at least slightly less expensive than those of their competitor. Leesa offers two mattress models (The Leesa and The Sapira). Their most popular product, The Leesa, begins at $525. Casper has three mattress models (The Essential, The Casper, and The Wave) that each vary in price. Their most popular product, The Casper, begins at $595. Leesa: Generally good – While there are some mixed reviews regarding Leesa’s customer service, their support team is generally deemed as helpful and above average. Casper: Strong – Overall, customers have reported Casper’s customer support to be responsive. The customer support and service operations of both companies are overall deemed above average across the board by their customer base. Well-Suited for People of All Sizes – Customers ranging from 130 to 230 lbs + have generally reported feeling comfortable on this mattress. Low Motion Isolation – The low motion isolation of the Casper mattress allows customers who are sharing their bed space to be able to move around or get up out of their bed without disturbing their partner. This means horizontal gymnastics are no longer necessary to get up to go to the bathroom in the middle of the night or to let your partner sleep in. Good for Back Pain – Many reviewers have praised the all-foam mattress for helping to relieve back pain, as well as hip and shoulder pain. May Have Initial Odor- Some users have reported an off-gas odor with Leesa mattresses. The brand combats the natural tendency of foam and adhesive materials to give off this odor, however, and is certified by Certi-PUR-US. Customers may also try airing a mattress for several hours to allow it to breathe. Doing this may help eliminate any potential initial odor. Slightly Heavier Than Its Competitor – Due to their weight (ranging between 55 and 104 lbs. ), they are not the easiest mattresses to carry around. This may pose a problem for individuals who reside in homes or buildings that are comprised of more than one story – particularly those without an elevator. However, it may be noted that Casper mattresses are still about 25% lighter than the average mattress. While both mattresses generally have high, or at least above average, ratings across most sites, their customer rating percentages do vary somewhat. It is important to keep in mind, however, that the reviews that are shared on these websites are subjective, anecdotal, and may not, therefore, be representative of each sleeper’s experience with the product. Evidently, their popularity spanning seller and review sites alike shows promise for buyers searching to buy a good quality mattress. The products’ strengths and weaknesses that have thus impacted the ratings of each mattress are discussed above. While both the Leesa and Casper mattresses are considered high-quality foam mattresses amongst their competitors, there is not one mattress that will be perfect for every sleeper. 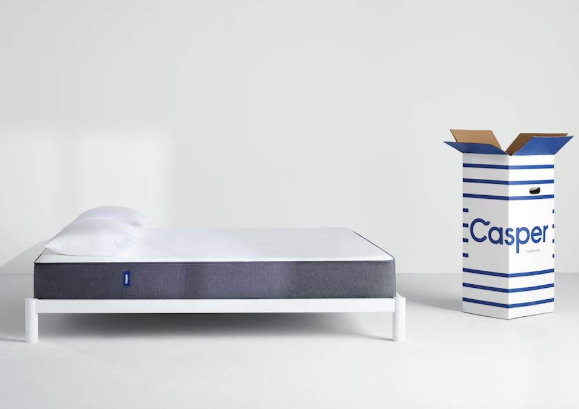 The Casper may be an ideal mattress for sleepers who like the sensation of melting into their mattress without necessarily lucking out on firmness. This bed also has generally received positive reviews from customers of all sizes. They also include those who are lighter-weight, average, or heavier. As far as one’s sleeping position goes, individuals who rest on their stomach or their side may find the most comfort lying on this mattress. If this sounds ideal for you, then buy the Casper now! The Leesa is also a firmer mattress that provides a little ‘bounce’ for users, unlike the ‘hug’ that is experienced with the Casper mattress. Weighing 25% less than the average mattress, it may be an easier mattress for individuals to lug around and adjust as needed. This product has been deemed slightly less stomach-sleep friendly than the Casper. Thus, may be found more comfortable by individuals who tend to rest on their side or back. You can buy the Leesa now! Finally, both Casper and Leesa offer a generous 100-day trial period for their mattresses. They also have helpful customer service teams that are responsive to questions or concerns from their customers. Featured image: CC0 Creative Commons via https://canva.com.